Sprout flow in rice fields, Middleton Place, Summerville, South Carolina, ca. early 2000s, courtesy of the Middleton Place Foundation. During the colonial period, rice proved to be the South Carolina Lowcountry's most lucrative cash crop. Lowcountry planters primarily used enslaved African skills and labor in inland and tidal rice cultivation. 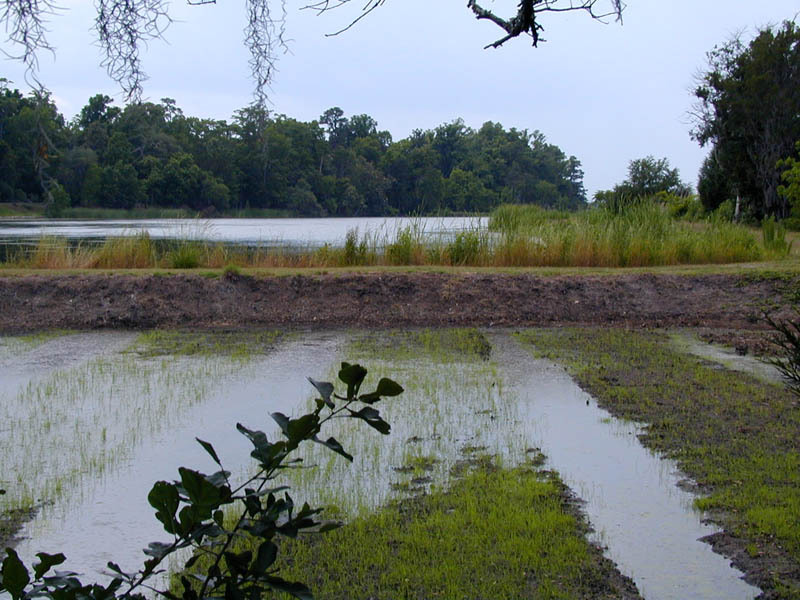 Rice plantations involved enslaved workers digging extensive systems of dikes, ditches, and fields, such as the one shown here at Middleton Place. 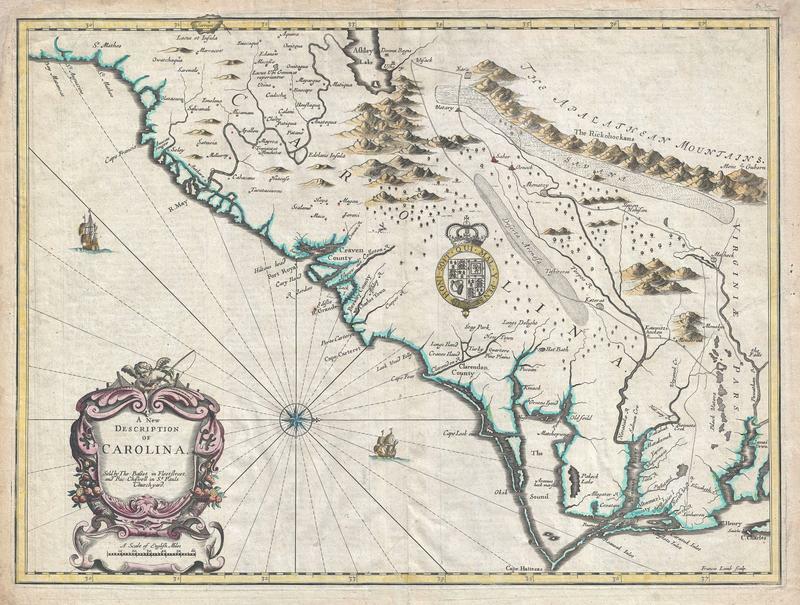 "A New Description of Carolina," map of the proprietary English colony of Carolina, John Speed, The Theater of the Empire of Great Britain, 1676. From the seventeenth to nineteenth centuries, Charleston and the surrounding Carolina Lowcountry region epitomized a slave society. Chattel slavery, the trans-Atlantic slave trade, and the domestic slave trade each played central roles in the Lowcountry's economy, labor structure, and social hierarchy. Scholars estimate that over forty percent of all enslaved Africans sent to North America entered through Charleston Harbor — making Charleston the largest North American point of disembarkation for the trans-Atlantic slave trade. From Charleston, traders forced many enslaved men, women, and children further into the American interior through the domestic slave trade, but a significant number were also sold as chattel property to slaveholders in the surrounding Lowcountry. While some enslaved Africans and their African American descendants worked in domestic service or artisanal trades, the overwhelming majority provided agricultural skills and labor on plantations. Cash crops produced through enslaved labor, particularly Carolina Gold rice, made Lowcountry planters some of the wealthiest and most influential individuals in North America. In Carolina, demand for enslaved black labor became so great that by 1708 the colony (and later state of South Carolina) featured a black population majority that lasted, with temporary fluctuations, until the Great Migration of the early to mid twentieth century. Broadside from The South Carolina Gazette, Charleston, South Carolina, May 1769, image courtesy of Middleton Place Foundation. Establishing Slavery in the Carolina Lowcountry, the second exhibition in the African Passages, Lowcountry Adaptations series, outlines various factors that caused slavery to become centrally significant to the economic, legal, and social structures of Charleston and the Lowcountry in the seventeenth and eighteenth centuries. 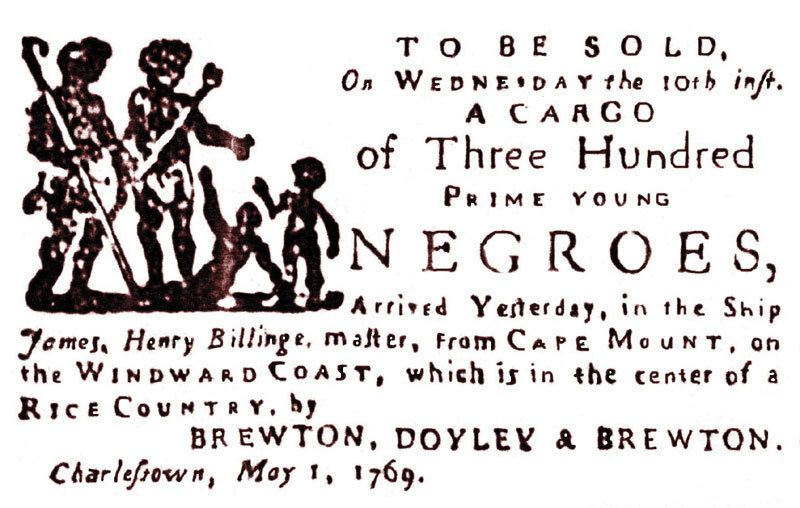 Slavery, as it developed in the English colony of Carolina, was both unique and part of broader patterns of this labor system's growth throughout North America and the Atlantic World. This exhibition contextualizes Lowcountry slavery within the broader development of North American and Atlantic World slavery, while also identifying the historic factors that defined the distinctive development of this labor system in Carolina. From the founding of Carolina in 1670, enslaved Africans, African Americans, and American Indians in the Lowcountry powerfully resisted the dehumanizing terms of chattel slavery. 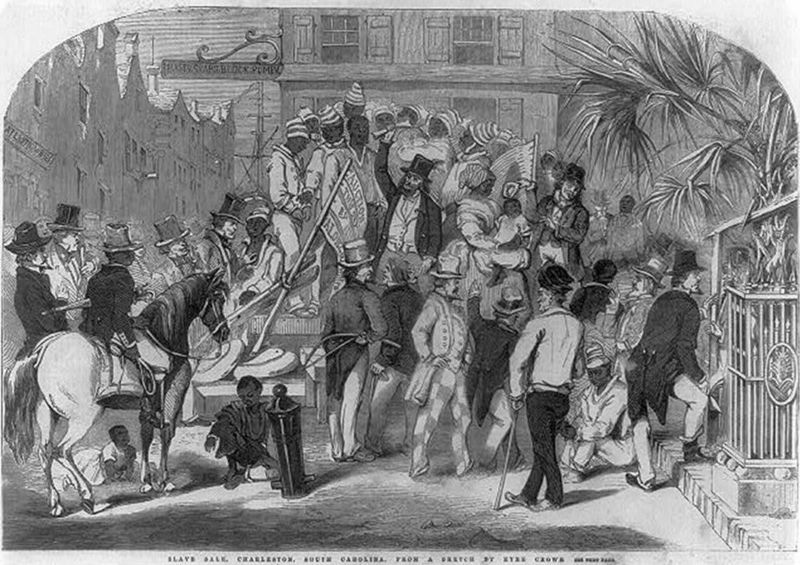 "Slave sale, Charleston, South Carolina," wood engraving, Illustrated London News, 1856, courtesy of the British Museum.